The best MW opening ever? Well, it´s impossible to compare what would have happened in the ´50-ies and ´60-ies. If you´ve had todays receivers and antennas and those nights with almost no electronic disturbances and a mediumwave band almost empty of European broadcasters after midnight. But this weekend was impressing compared to anything! I was in the schack in Fredriksfors Thursday night and Friday morning. I heard a lot of new stations. But what would have happened if I´ve had the possibility to be out there also in the afternoons and the evenings. Some friends heard for instance some 20 Alaskan stations in the afternoon on Sunday, when also KUMU 1500 (HI) was heard for a couple of hours. And seldom (or possibly never) heard daytimers came in at about 21 UTC. The only thing to be sure of is that there´s a lot of stations I have never heard. Of course thouse are the best ones. But still, what´s left is quite astonishing as far as we also have some problems with local disturbances due to "villages" as Delsbo and Fredriksfors with housing and some small industries. On Friday morning I heard two stations from Hawaii!. KUMU 1500 has been widely heard this winter, but AM 9-40 was a real surprise. Both coming in with quite a good signal and 9-40 with just the right music to get that feeling of something exotic. 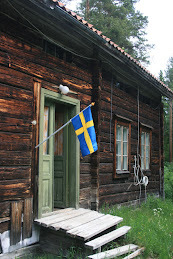 But there were also a quite a few other stations I hadn´t expected to hear here in the central part of Sweden. With the use of the (not longer so new) SDR-technology and propagation of exceptional standards many stations earlier only "possible" to dx-expeditions in the far north of the Nordic countries has been possible to catch also some 1 000 kilometers to the south. At about the same hours stations came though from Alaska, Washington, California, Texas and New York. We are talking of really "broad" propagation. But it wasn´t only a weekend of great catches of new stations. I also had a most interesting email from Greg Maiuro of AM 1400 WOND in Pleasantville, NJ. The station came in earlier this winter when CBC Gander took a short breath in just the right place. Greg, who has worked in sports media for almost 30 years has his own talkshow on Friday nights on WOND. And he got his eyes on my report of reception. Now he has asked me to be on his show this Friday night when he´s warming up for the Superbowl a couple of days later. He´ll phone me at about 11.45 PM UTC, that is 6.45 EST there in Pleasantville, and we´ll talk a little about my listening hobby and what I think of the Superbowl. Loggings from Fredriksfors after Xmas. This gives us 11 different directions but that doesn't help much when conditions are poor. Also, we are often having severe local electrical interference, especially on the 317-beverage. Sofar the source of these disturbances has not been located. There is also one delta loop designed for 60 metres SW plus one G5RV dipole antenna. As I live quite far from the shack (some 350 km's) I am not able go there very often. Here are some loggings from just before the end of 2008.